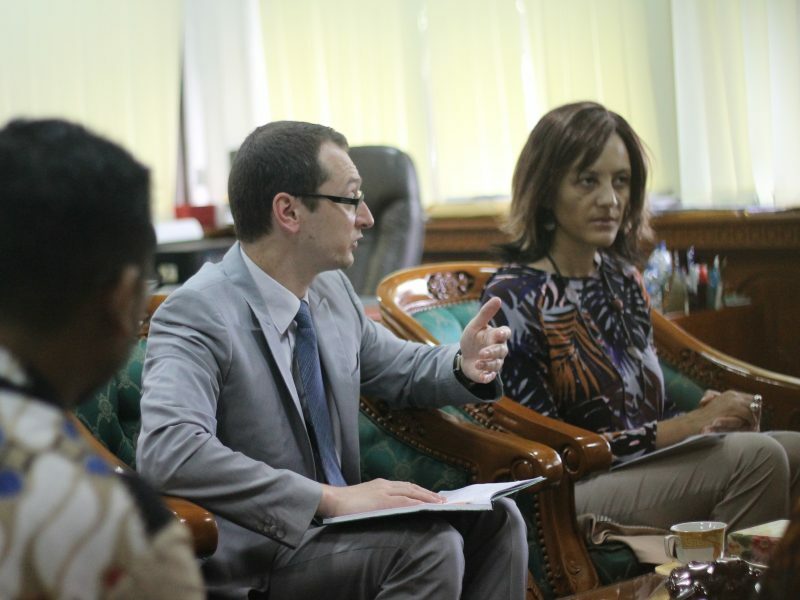 Monday, February 05, 2018 UMY welcomed the representative belong to France Ministry of International Affairs and National Development, Mr. Cyrill Gerardon which also accompanied by Ms. Sarah Camara the Director of IFI (Institute France Indonesia) and Ms. Merry Andriam who is a France native translator and Director of IFI’s Education Division in the occasion of France Ministry observation toward Warung Perancis UMY. The occasion starts with Dr. Gunawan Budiyanto’s (UMY Rector) greetings, continued with small discussion regarding the continuing possibility of reciprocal cooperation within both parties, and ends with visitation to Warung Perancis UMY (WP UMY). Mr. Cyrill in his statement in the discussion with Dr. Gunawan, Ms. Farindira Vesti Rahmawati (Director of Domestic Affairs and Administration) and Ms. Hijria Fitriani (Director of UMY Public Relation and Protocol Bureau) affirmed that this visitation not only to observe WPUMY but also to talk about future cooperation. He stated that France and Indonesia might found a vacuum of political fruitful cooperation within past a year, so in the term to manage to overcome the problem, the French Ministry hoped the vitiation could be a good step to start it over. As Mr. Cyrill offered the possibility to have a cooperation with UMY in Student Exchange Program and Joint Research, Dr. Gunawan as the UMY Rector also offered various summer program and International Cultural and Culinary Festival 2018 which seen as a starter of this cooperation in the future. After had the discussion and photo group with the Rector finished, the representatives moved on to WP UMY. As they arrived, Mr. Cyrill shown his impressed expression by giving a warm greeting to the students as in WP UMY in the same time held a culinary event ‘La Chandeleur’ with ‘Jour des Crepes’ as the main theme. 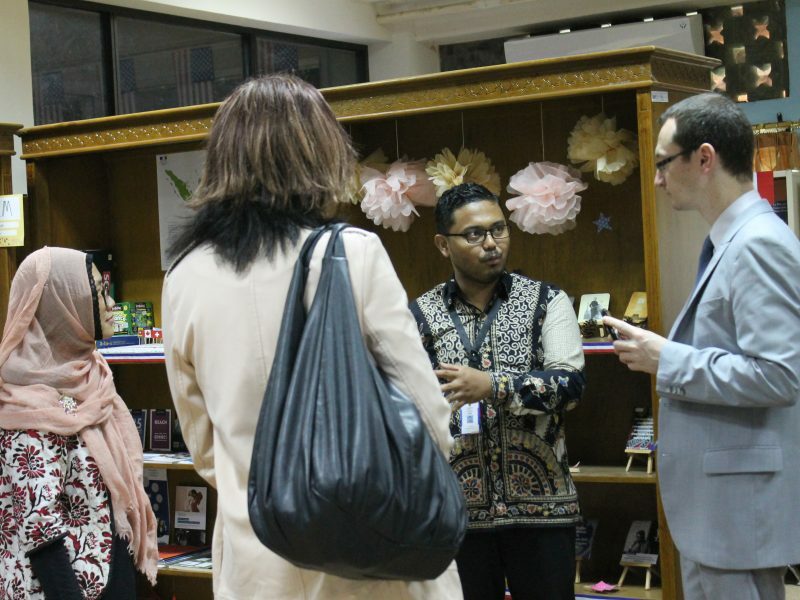 He is also stated to Mr. Phutut Ardhianto, M.Pd as the Director of WP UMY about how impressed he is regarding WP UMY actively contributed to spread France culture to students not only in UMY but around Yogyakarta. 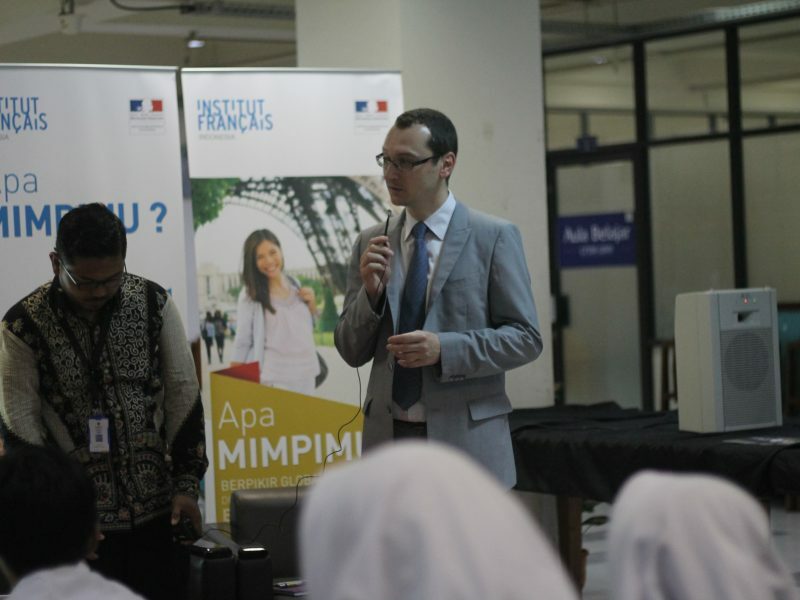 As WP UMY known as the best Warung Perancis in Indonesia since 2015, Mr. Ciryll as the representative of France Ministry hoped the contribution of WP UMY to spreads France Culture and Language will be a massive success and kept developing in the future.